For beginners, some of the cooking terms can be confusing and intimidating. For that reason, I have compiled a list of the BASIC ones, to make it easy for you to understand. Luckily for me, I have been in the kitchen long enough to know most of them, (except the baking terms). When you are following a recipe, this will help you understand the method of cooking. There are more terms that are used in Gourmet Cooking, such as Bechamel, but will save them for a future post. Baking powder: A combination of baking soda, an acid such as cream of tartar, and a starch or flour (moisture absorber). Most common type is double-acting baking powder, which acts when mixed with liquid and again when heated. Baking soda: The main ingredient in baking powder, baking soda is also used when there is acid (buttermilk or sour cream, for example) in a recipe. Always mix with other dry ingredients before adding any liquid, since leavening begins as soon as soda comes in contact with liquid. Baste: To moisten food for added flavor and to prevent drying out while cooking. Bone: To remove bones from poultry, meat, or fish. Bouquet garni: A tied bundle of herbs, usually parsley, thyme, and bay leaves, that is added to flavor soups, stews, and sauces but removed before serving. Braise: To cook first by browning, then gently simmering in a small amount of liquid over low heat in a covered pan until tender. Bread: To coat with crumbs or cornmeal before cooking. Broil: To cook on a rack or spit under or over direct heat, usually in an oven. Brown: To cook over high heat, usually on top of the stove, to brown food. Caramelize: To heat sugar until it liquefies and becomes a syrup ranging in color from golden to dark brown. Core: To remove the seeds or tough woody centers from fruits and vegetables. Cream: The butterfat portion of milk. Also, to beat ingredients, usually sugar and a fat, until smooth and fluffy. Cube: To cut food into small (about 1/2- inch) cubes. Cut in: To distribute a solid fat in flour using a cutting motion, with 2 knives used scissors-fashion or a pastry blender, until divided evenly into tiny pieces. Usually refers to making pastry. Deep-fry: To cook by completely immersing food in hot fat. Deglaze: To loosen brown bits from a pan by adding a liquid, then heating while stirring and scraping the pan. Dollop: A spoonful of soft food such as whipped cream or mashed potatoes. Dot: To scatter butter in bits over food. Dredge: To cover or coat uncooked food, usually with a flour, cornmeal mixture or bread crumbs. Dress: To coat foods such as salad with a sauce. Also, to clean fish, poultry, or game for cooking. Drippings: Juices and fats rendered by meat or poultry during cooking. Drizzle: To pour melted butter, oil, syrup, melted chocolate, or other liquid back and forth over food in a fine stream. Dust: To coat lightly with confectioners’ sugar or cocoa (cakes and pastries) or another powdery ingredient. Fines herbes: A mixture of herbs traditionally parsley, chervil, chives, and tarragon, used to flavor fish, chicken, and eggs. Flambé: To drizzle liquor over a food while it is cooking, then when the alcohol has warmed, ignite the food just before serving. Flute: To make decorative grooves. Usually refers to pastry. Fold: To combine light ingredients such as whipped cream or beaten egg whites with a heavier mixture, using a gentle over-and-under motion, usually with a rubber spatula. Grate: To rub foods against a serrated surface to produce shredded or fine bits. Grease: To rub the interior surface of a cooking dish or pan with shortening, oil, or butter to prevent food from sticking to it. Grill: To cook food on a rack under or over direct heat, as on a barbecue or in a broiler. Grind: To reduce food to tiny particles using a grinder or a food processor. Julienne: To cut into long, thin strips, matchsticklike in shape. Knead: To blend dough together with hands or in a mixer to form a pliable mass. Macerate: To soak in a flavored liquid; usually refers to fruit. Mince: To cut into tiny pieces, usually with a knife. Parboil: To partially cook by boiling. Usually done to prepare food for final cooking by another method. Poach: To cook gently over very low heat in barely simmering liquid just to cover. Purée: To mash or grind food until completely smooth, usually in a food processor, blender, sieve, or food mill. 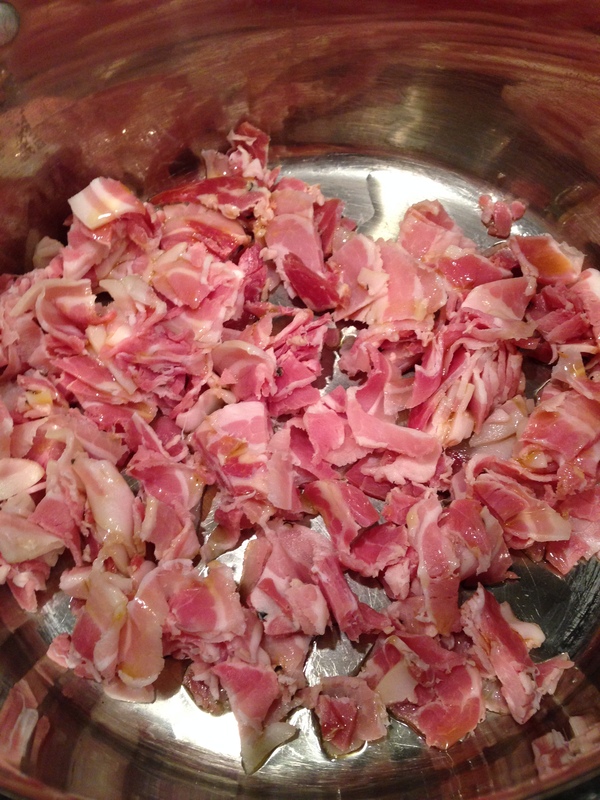 Render: To cook fatty meat or poultry—such as bacon or goose—over low heat to obtain drippings. Roast: To cook a large piece of meat or poultry uncovered with dry heat in an oven. Sauté or panfry: To cook food in a small amount of fat over relatively high heat. Scald: To heat liquid almost to a boil until bubbles begin to form around the edge. Sear: To brown the surface of meat by quick-cooking over high heat in order to seal in the meat’s juices. Shred: To cut food into narrow strips with a knife or a grater. Simmer: To cook in liquid just below the boiling point; bubbles form but do not burst on the surface of the liquid. Skim: To remove surface foam or fat from a liquid. Steam: To cook food on a rack or in a steamer set over boiling or simmering water in a covered pan. Steep: To soak in a liquid just under the boiling point to extract the essence—e.g., tea. Stew: To cook covered over low heat in a liquid. Stir-fry: To quickly cook small pieces of food over high heat, stirring constantly. Whip: To beat food with a whisk or mixer to incorporate air and produce volume. Whisk: To beat ingredients (such as heavy or whipping cream, eggs, salad dressings, or sauces) with a fork or whisk to mix, blend, or incorporate air. Zest: The outer, colored part of the peel of citrus fruit. * I added, Chop to the list, using my definition. I hope you will find this list of cooking terms very handy and useful. Happy Cooking in your Kitchen! Handy list for novice cooks following recipes…saves time!